Ashley Fagan on Monday lets passing traffic know that Wendy’s, on Pacific in Albany, is open again. 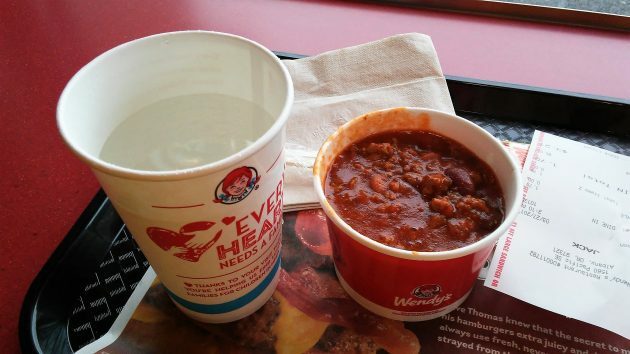 In case you missed the news, fellow fans of Wendy’s chili, the Albany franchise of the famous fast-food chain is back in business. The restaurant at 1560 Pacific Blvd. S.E. was closed for more than two years after being abruptly shut down in January 2015. Over the last few months the building was thoroughly remodeled inside and out, at a cost estimated on the building permit at more than half a million dollars. And at mid-morning Monday, the place opened its doors under new management. Even after lunch time, which is when I got there on the bike, the line of customers inside stretched nearly to the doors — no doubt a sign of pent-up demand — while vehicles queued up around the building for the drive-up window. My family, including me, are so happy the Wendy’s is back!! 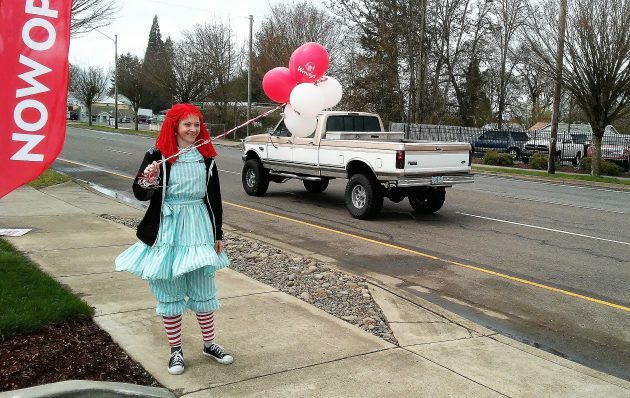 When Corvallis’ Wendy’s closed down and was turned into a Burgerville, Albany lost its claim to fame as the southern edge of the Burgerville Empire. But now Albany once again has Wendy’s and Burgerville. Take that Corvallis! PS, plus we have Hasty Freeze. Please fix your cool neon sign. Long live fast food nation! USA! USA! Thanks for coming back to Albany congratulations on the opening of the store! Sure is a beautiful truck in this picture..